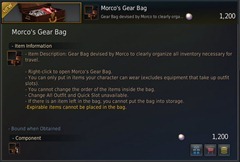 Patrigio’s Costume Bag and Morco’s Gear Bag are two items released on May 17 patch and available for loyalties and pearl respectively. This bag is only available through loyalty and it costs 2800 Loyalty. 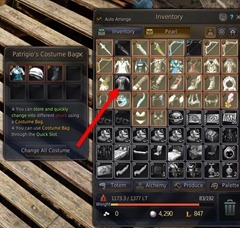 It is basically a bag you can open to store any of the costumes in your pearl tab so you can quickly swap them by putting the costume bag on a hotbar. It takes up one slot in the pearl inventory tab. You cannot store it in the warehouse if you put anything in it. Say I am your average lifeskill BDO player with a Canape costume for cooking and the Venecil costume for processing along with a third costume set for combat. This means I no longer need to go through the pearl tab to hunt down costumes to swap. I can simply put Canape costume in one box, Venecil in another and use hotbars to swap costumes effortlessly. While this costume bag has 8 slots, you obviously only want to put costumes of the same set in one to reduce hassle when swapping. Does this works on crafted costumes converted into pearl costumes with the Equipment Tailoring coupon? The answer seems to be no as they are greyed out even though they are in the pearl tab. 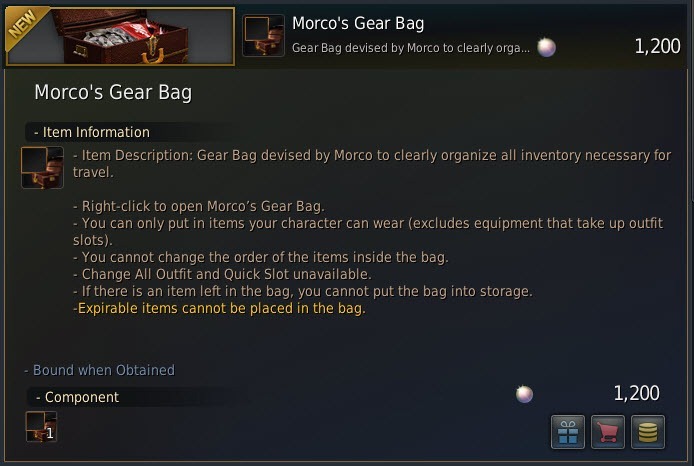 Morco’s Gear Bag is only via Pearls (1200 Pearls) and it is used for equipment/gear instead in your inventory tab.It takes up one slot in your normal inventory tab and you cannot store it in the warehouse if you put anything in it. 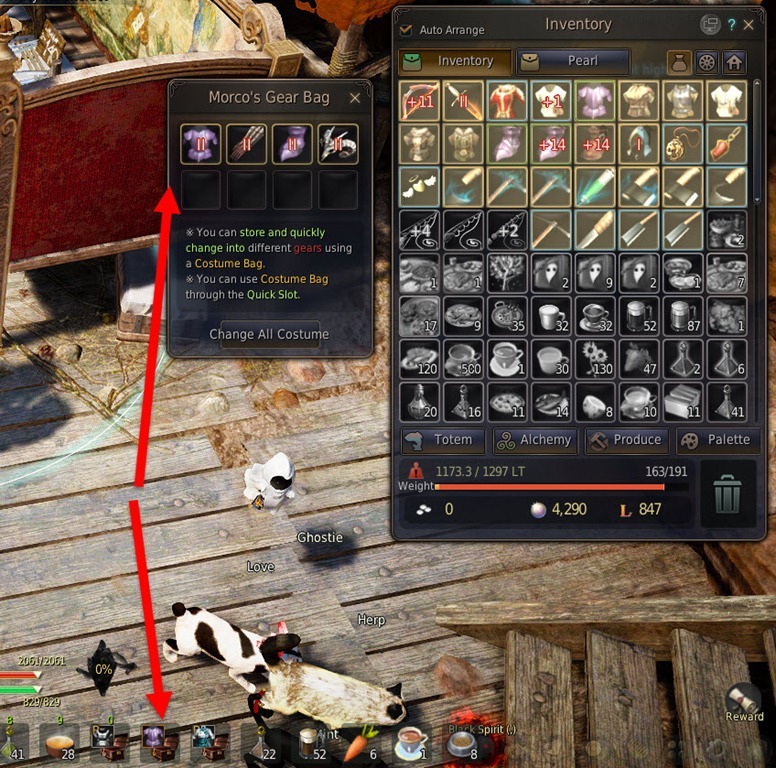 You can either store extra gear for failstacking here or use it to swap gear in/out when you are using those lifeskill costumes. Likewise you can put them on your hotbar for one click swapping. 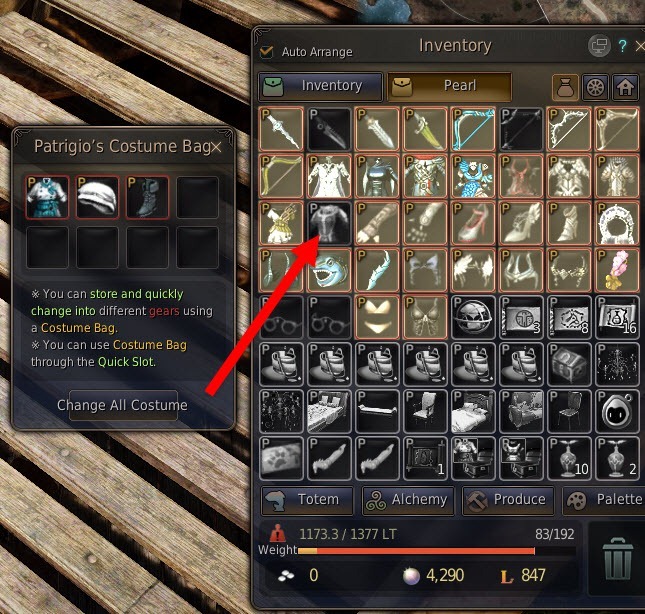 This bag allow you to store lifeskill costumes, combat gear/weapons, and any of the crafted costumes that havn’t been converted with the Equipment tailoring coupon. the Equipment Tailoring coupon? The answer seems to be no…” Works at least with my costume made delphe knights costume. That’s nice I suppose, and weird too. 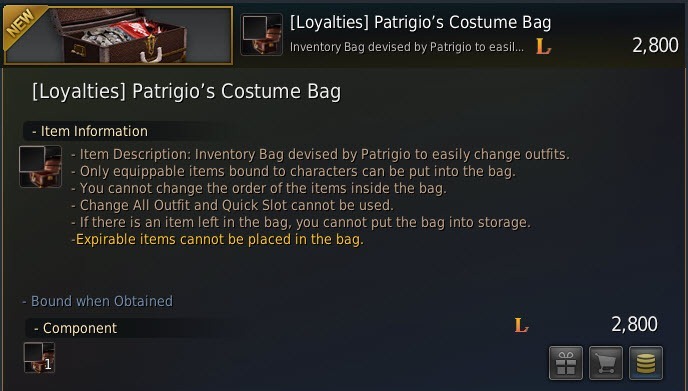 Perhaps it only works for non-lifeskill crafted costumes that have been converted? Makes no sense still. To be honest, i do not understand the benefit of these bags. Is it just swaping time between costumes/gear? 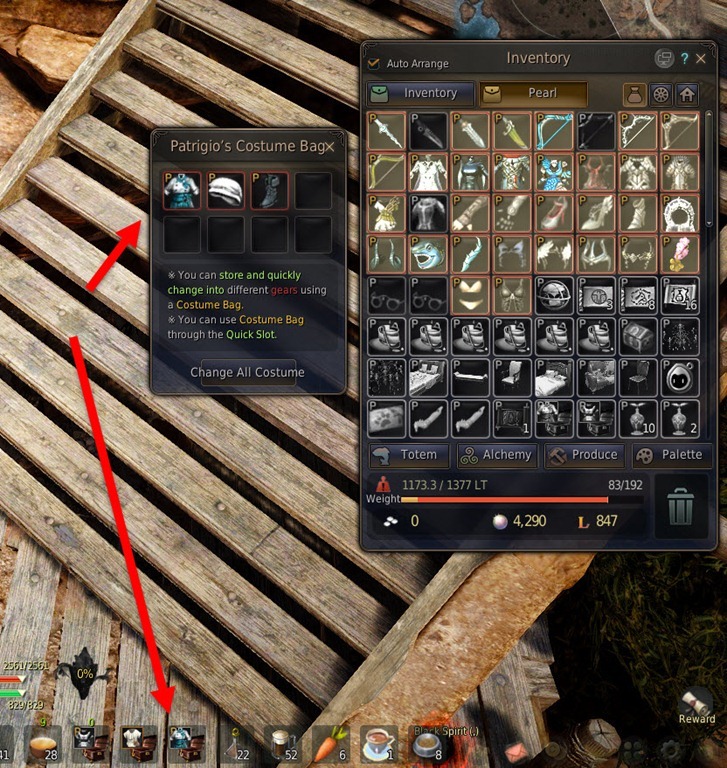 If you had one of the bags in inventory, wouldn’t it add an extra 7 slots for gear type items? So if I put pieces of Lahr Arcien followed by a kibelius set, and just for good measure, the 2 pc ram horn witch set. Would pressing bag hotkey rotate these each use? Or do I need several bags? Of course the one used for gear in your restricted inventory is the one bought for real money when the one obtained for free is the one used for real money outfits in your massive pearl inventory. PA yet again showing off the pay to win aspect of the game.